Caution: This product is safe on all cooling system components however; the same inherent risks exist here as with any chemical flush service when performing this service on older high-mileage vehicles. If the vehicle has a lot of deposits in the system, there is a risk that in cleaning the deposits we may plug a narrow passage in the heater core or reveal something that needs to be repaired. The technician needs to evaluate the situation and avoid chemically flushing high-risk vehicles. What is the advantage to flushing the cooling system with a chemical? When we introduced computers into high-tech fuel injected engines, we needed sensors to feed necessary data to the computer. The computer and sensors are absolutely effective at what they were designed to do, which was to ensure maximum performance and efficiency of the power plant, while achieving the best fuel economy and lowest emissions possible. However, sensors are extremely sensitive to deposits. We have created highly efficient fuel injected engines that are higher revving, run hotter, and are more susceptible to deposits than their big V8 predecessors. Coolant, like all other fluids in the vehicle, requires an additive package in order to work. Glycol and water, in the right mixture (usually 50/50) will prevent engine coolant from freezing, as well as preventing the coolant from overheating. However, glycol and water without an additive package are extremely corrosive. Alone they would destroy the very engine they are designed to protect, in a very short time. Glycol must be stored in stainless steel tanks; otherwise it will eat right through the metal. It is the additive package in coolant that prevents this from happening in the engine. Coolant must remain pH balanced (between 9 and 11 - 10.5 is usually ideal) in order to be effective. If it becomes acidic it becomes destructive to the engine and its components. 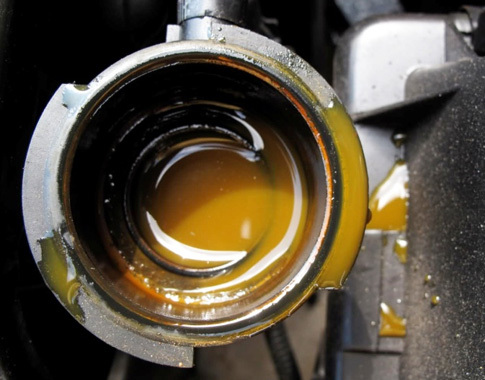 Engine coolant has the potential to stop the engine without immediate visible damage. Many drive-ability and no start types of conditions could be coolant related. When a technician is diagnosing these types of problems and calls the problem up on "Mitchell On Demand" or "All Data" types of computer diagnostic programs, it will often say check engine coolant. What could be happening is that the coolant may have become acidic and created a galvanic cell, producing very slight electrical charges that can affect the sensors. Another common problem is that sensors that are exposed directly to the coolant may get organic, and other types of deposits on them that will affect them negatively. The problem is that sometimes these effects are not visible, even in the coolant. It is not possible to look at coolant and know whether it is acidic or not. It may look like new. The only way to know for certain is to test the coolant for acidity with a coolant test strip. This will tell the technician where the pH level is, however it does not indicate whether or not deposits are affecting the sensors. Another common problem in today's engine is again related to our high-tech efforts to achieve fuel efficiency. We are using aluminum block engines more and more, because they are lighter and consequently more fuel-efficient. Unfortunately, aluminum oxidizes easily when exposed to a hydrocarbon rich environment. The byproduct deposit here is silicate dropout. This is a gummy destructive substance that needs to be removed. Another common contaminant in engine coolant is oil. The only way to remove these types of difficult deposits is with the right chemical additive. You can flush a cooling system all day long and never clean it if you do not have an effective chemical. Keep in mind; the coolant is being literally flushed throughout the entire engine all the while it is running with the thermostat open. The act of flushing is not what cleans the system - it is the chemical you use. As with all other areas when it comes to fluid maintenance, there are some good and some poor quality products. There are products that are harmful; there are products that are not effective. Many products contain sulfuric acid as their cleaning agent. Sulfuric acid is not recommended for use in the cooling system - in fact, at one time Ford and many other OEM's pulled their cooling system flush products off the market because they contained sulfuric acid. Is the SelTec® product safe? The SelTec® Cooling System Flush is a patented compound that is highly effective at removing organic deposits, oil, silicate dropout, and most other deposits. It does not contain any sulfuric acid and is completely safe on steel, aluminum, iron, brass, copper, plastics, rubbers, and all components in today's cooling systems. It is also compatible with long-life coolant. The procedure we recommend for this service is to install the SelTec® Cooling System Flush #707 chemical into the existing coolant, run the engine for a period of time long enough to ensure that the thermostat opens and the coolant has cycled through the heater core at least once, then drain the coolant and refill with new coolant and install the SelTec® Cooling System Conditioner #1010. The conditioner will neutralize any flush chemical left in the system, add reserve alkalinity, balance pH, reduce foaming, and improve heat transfer.